THE Ghana Chamber of Mines is seeking government support in the fight against activities of illegal small-scale miners popularly referred to as “galamseyers”. The 2016 edition of the West African Mining and Power Conference (WAMPOC) created the platform for industry players to discuss appropriate strategies for addressing global and national challenges confronting the mining and power sectors of Ghana. Ghana Gold Limited, said, “The government must support us to help light the menace of galamsey to foster confidence in the sector.” The Deputy Minister of Lands and Natural Resources, Mr Kwabena Mintah Akandoh, who also spoke at the forum, said the government would continue to ensure a streamlined and well-managed small-scale mining sector that contributes to national development without compromising the ability of large-scale operators to operate peacefully on their licensed areas. “Some interventions to address the illegal mining challenge include the passage of the Minerals and Mining (Amendment) Act, 2015 (Act 900).Act 900 provides for the confiscation of equipment used in illegal mining, as well as the products mined,” he said. All these efforts, he explained, were expected to augment existing efforts such as regional task forces on the protection of natural resources, alternative livelihood programmes, among others, to significantly reduce illegal small-scale mining in the country and promote a formalized and well-structured small-scale mining sector. 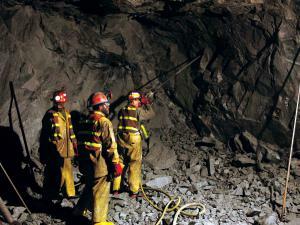 Need for collaboration: The deputy minister also reiterated the need for the traditional authorities to engage the mining firms so the benefits from their operations could profit the larger community. “The government and industry operators may not have all the answers. Therefore, traditional authorities should also promote dialogue and consensus building with mining firms with the objective of maximizing the economic and social benefits from the mine,” he said. He added that as much as possible, those benefits should be channeled into other economic activities to promote the development of independent communities which would promote sustainability and also prevent the development of ghost communities after mine closure. “WAMPEX is also ideal to promote learning between countries with rich experience in exploiting mineral resources.” It was on the theme: “Sustaining mining and power investments -meeting stakeholder expectations in a challenging global environment,” and was organized by Events and Projects International in collaboration with dmg events. The conference was endorsed by the Ghana Chamber of Mines, the Ministry of Lands and Natural Resources, the Energy Commission and the Minerals Commission.